to our new furry friend. However I must warn you that the cuteness of the picture might cause your computer to meltdown. The Shifley family is proud to welcome Tank to the blogosphere. We had a few names picked out for him but he was called Tank and we really liked it so he is going to be Tank. Operation Dwarfshank Redemption was a success and so far so good. Tankers is 19-months-old so the house is going to be a little crazy with him and a baby boy running wild in the house. There will definitely be a few toddler circuses in the days ahead but me and Mrs. Shife are looking forward to it. That is all for now as I just took some Nyquil so I will be chasing the dragon soon. Have a great weekend. Tank looks like he already knows he's the regal ruler of his domain. And Baby Shife looks like he's pretty happy about that. Hello Tank, welcome to blogshire. I don't think it will be long before you and Baby Shife are bosom pals. And don't let Poppa Shife fool you, he's a sucker for Bassets. AAAwwww! Tank! Him sweet. He'll make a good buddy for Baby Shife you can see it already. Plenty of good times ahead, plenty of "it wasn't me it was Tank" moments on the horizon, and lots of basset lovins. Rescue dogs are the best. COngrats! Looking like Lil Shife and his new pal are getting along quite well already. Congrats on both Big Shife! Not sure who is cuter. Glad to see you've got two winners there! tank's a beauty and baby shife has a new best friend. would the name be connected to tank mcnamara? Tank and baby Shifey are lookin' good. Can't wait to hear about the adventures these two will be going on soon. Heh, "Chasing the Dragon." One of my favorite underused phrases. Tank huh? Good name, great pic! Looks like he fits in nicely, like it was meant to be. 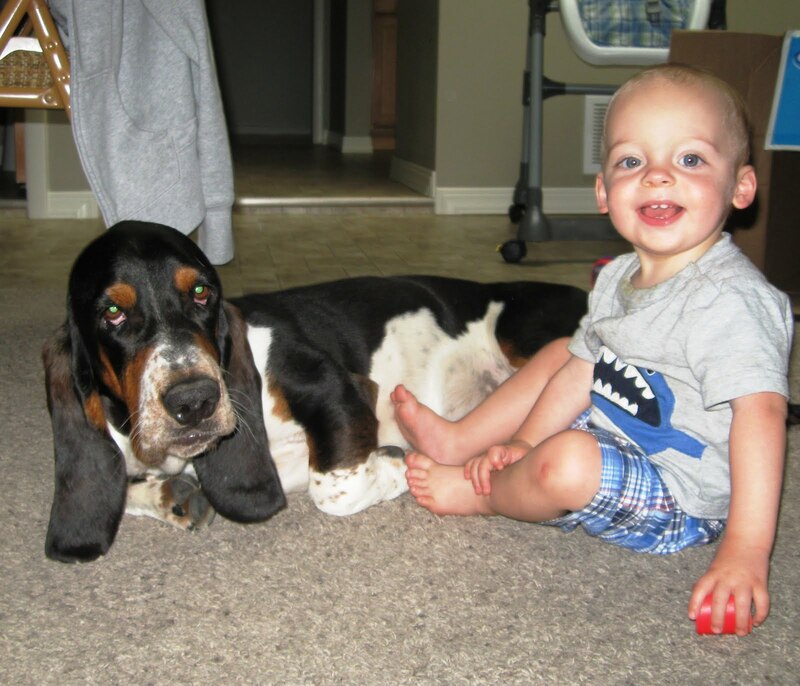 Can't wait for more basset tales and toddler hijinks. Ahhh, life is good, eh? Cute dog and cute baby! Please let us know of your deranged Nyquil dreams! How lovely! Are you going to teach him tricks? I love watching human infants tap dance. Oh I am so happy I came here today... 3 days late, but great news indeed! Tank looks perfect for your circus and I LOVE the name. He looks very huggable. Tank is quite a looker!